inflatable castles with slide offer a safe playing environment for kids. 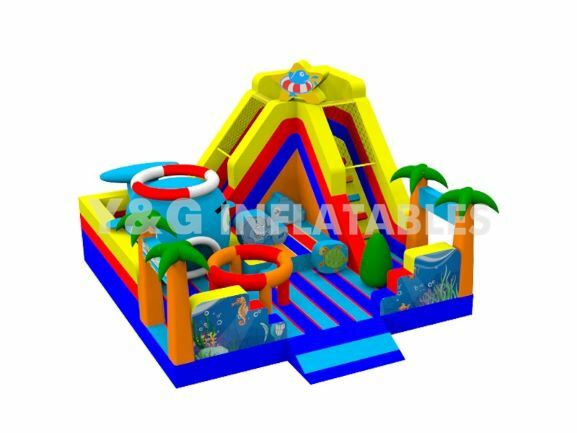 Kids can enjoy games and jumping in safe environment of jumping castle.Children can also experience the feeling of airborne gliding on the slide. Parents should limit the number of kids using jumping castle if they feel any safety issue. Playing in inflatable castle with slide can help improve imagination of kids. When kids jump in bouncy castle they feel as if they are flying in the air. Kids can dig deep into the world of jumping castle. They can create new games using bouncy castle. Inflatable course bouncy castle improves forward thinking, planning and strategy making in kids. Apart from this, jumping castle also helps kids learn balance. The surface of bouncy castle is unsteady; kids try to keep their balance for jumping, rolling and running in bouncy castle. Apart from this, playing in the inflatable castle with slide can also improve physical skills of the kids.